This is the scenario where RPA Robotic process automation applied. The project a BPO operator before creating a order he/she has to get information from three different servers. From one server by entering customer name he has to get customer code. Then, he has to enter customer name to get e-mail address. From the third server he has to get mailing address and shopping cost by entering customer name and customer code. To automate this process with Blue Prism, a developer or business analyst uses Object Studio to create avisual business object for each of the three applications. To interact with the application, each VBO uses an appropriate interface: the Windows interface, the mainframe interface, and the HTML interface,respectively. application. For example, the VBO that interacts with the client/server application might contain a login operation, an operation that enters the customer’s name, another operation that retrieves the customer code, and a logout operation. 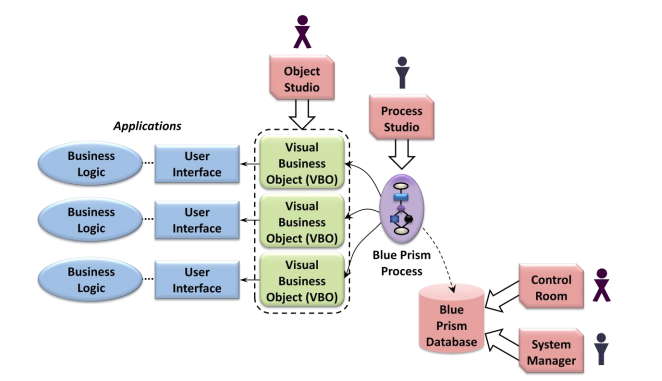 Once these objects have been created, a developer or business analyst uses Process Studio to define graphically the steps in the Blue Prism process. Each step can invoke operations in one or more VBOs. In this example, the process has three main parts: entering data into the client/server application and getting a result, entering data into the mainframe application and getting that result, and entering these results into the Web-based application. Once the VBOs and the Blue Prism process have been created, the complete solution can be executed. An IT or business person can use Control Room to start and stop instances of the process, monitor its execution, or perform other management tasks. To determine who’s allowed to run the process, audit how people use the system, and more, a Blue Prism administrator uses System Manager. And to help create this application safely, Blue Prism defines a specific methodology for designing, building, and deploying a new automated process. To store VBOs, Blue Prism processes, and information about them, the product provides a SQL Serverbased database. IT and business people can use a tool called Control Room to start Blue Prism processes, view information about running processes, and more. Another tool, System Manager, allows configuring users, viewing audit logs, and performing other management tasks. Many people read this post. Thanks.